ST. GEORGE– Two men in their 20s were transported to the hospital early Tuesday morning following an end-over-end rollover off Foremaster Drive in St. George after which the driver was arrested for DUI. At approximately 3:15 a.m., St. George Police officers responded to the east side of Foremaster Drive on a reported truck that had rolled, the Police Department said in a statement issued Tuesday. The truck then began rolling backwards down the hill approximately another 100 feet. The 25-year-old man driving the truck was ejected from the truck as it rolled, the police statement said. 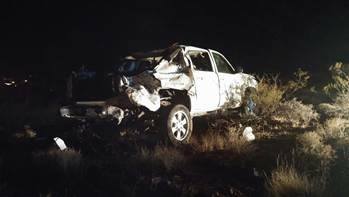 A 21-year-old male passenger was pinned in the rear passenger seat of the truck where he had to be extricated by emergency responders. Both the driver and passenger were transported via ambulance to Dixie Regional Medical Center in St. George with minor injuries that were not life-threatening. This report is based on preliminary information provided by the authorities and may not contain the full scope of findings. Persons arrested or charged are presumed innocent until found guilty in a court of law or as otherwise decided by a trier-of-fact. What ward are they from? You get a car! You get a car! You get a car! Everyone in the audience gets a brand new car! Instant As—–, just add alcohol! Speaking of as—–s, I see Koolaid has been here. Non-Mormons hate him too. Take me, for example. Nice generalization. But it’s OK for you to judge, right? R U COMPETANT? WHY WOULD YOU SAY TWEAKERS?? ?CAN YOU READ.